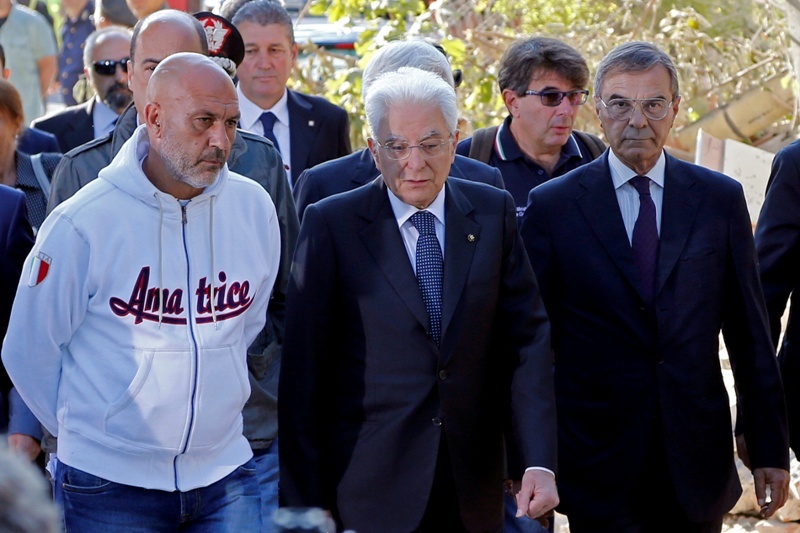 Italian President Sergio Mattarella (C) is seen with Amatrice mayor Sergio Pirozzi (L) during his visit to Amatrice after the earthquake in central Italy August 27, 2016. REUTERS/Ciro De Luca. A lawyer for the Italian town of Amatrice, where nearly 300 people died in an earthquake in August, announced last week that the town would file criminal defamation charges against the French satirical magazine Charlie Hebdo. Debate on the cartoons has focused primarily – and inevitably, whenever Charlie Hebdo is involved – on the limits of satire. Amatrice’s lawyer, Mario Cicchetti, condemned the drawings as a “senseless and unconscionable insult of the victims of a natural event”. The extent to which the deaths in Amatrice can be fully ascribed to a natural event or whether alleged corruption connected with poor building standards in one of Italy’s most earthquake-prone regions also played a role is, of course, what Charlie Hebdo apparently sought to highlight. For his part, the magazine’s editor-in-chief has described the reactions to the drawings as “completely hysterical” and indicative that “death is still taboo”. But regardless of whether one thinks that the Amatrice cartoons speak to uncomfortable truths about local building standards – and therefore a defensible, if not particularly pleasant, contribution to public debate – or were actually just an exercise in supremely poor taste, the legal case itself raises a number of concerns for free expression. The town of Amatrice has reportedly filed charges for “aggravated defamation”, an offence carrying up to three years in prison under Art. 595 of the Italian Criminal Code. But the European Court of Human Rights, the U.N. Human Rights Committee and the OSCE’s media freedom watchdog have all criticised the threat of criminal sanctions in defamation cases, mostly due to the potential for a wider chilling effect on freedom of expression. 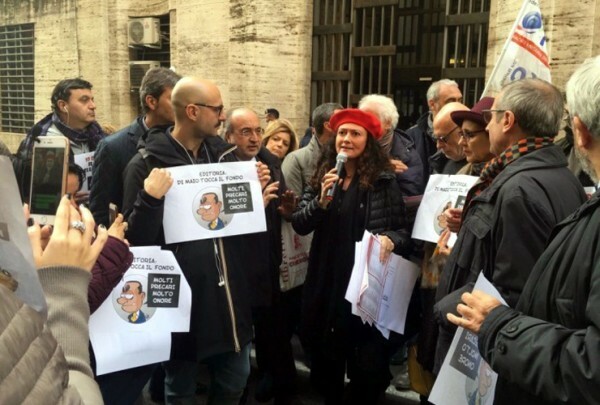 While the jailing of journalists for defamation is unheard of in most EU countries, Italian courts in recent years have sentenced a number of reporters to prison. The Council of Europe’s Venice Commission urged Italy in 2013 to address this situation “as a matter of priority”. Italian lawmakers were poised to eliminate the possibility of imprisonment in 2014 as part of a long-awaited defamation reform that has since sputtered. It’s not just the method that’s problematic in this case. It’s also the justification. Defamation laws exist to protect the justified reputations of natural and legal persons. If that’s the case, whose reputation has been (allegedly) smeared in this case? Reading the cartoons together, it’s clear we are meant to see the earthquake victims as casualties of shoddy construction. So if anyone should be suing for defamation, it’s the impugned “mafia”. Rather than protecting reputation, the main motivation for the charges seems to be anger at seeing the dead portrayed in such a glib manner. Amatrice’s lawyer said the cartoons “offend the memory of all the victims of the earthquakes”. The president of Italy’s Lazio region, where Amatrice is located, was quoted as saying he supports the town’s case because “there has been an element of indignation and, if such an affected community feels hurt, it is right that that there is also a concrete response such as a criminal complaint”. But these arguments are worrisome because, broadly speaking, they reflect the same thinking behind, say, efforts to punish criticism of religion on the grounds that believers have a right not to be offended or shocked. Put simply, “offence” and “indignation” are not, on their own, legitimate grounds for a defamation lawsuit. Otherwise, anyone who feels “hurt” by criticism in the media would have grounds for redress, regardless of whether that criticism is warranted. Unfortunately, the Italian Criminal Code promotes an expansive understanding of which types of speech may be punished. It defines defamation as “offending the honour and dignity” of a person – a catch-all for anything unpleasant – and makes no distinction between factual accusations and value judgments (opinions). Finally, we should note that the charges in this case were filed by the town itself and that “offence to Amatrice” was cited as a cause. The problems with allowing a government body to sue or file charges for defamation are obvious. Allowing the “state” – any kind of public institution or body – to target journalists who criticise it subverts the media’s watchdog function. Reputation and dignity are personal; attacks thereupon are suffered by people, not flags, anthems or towns (insulting the national flag or anthem is a crime in Italy and in a handful of other EU states). It’s one thing for Amatrice’s mayor to file a personal civil suit should he be able to demonstrate that his personal reputation had been damaged. 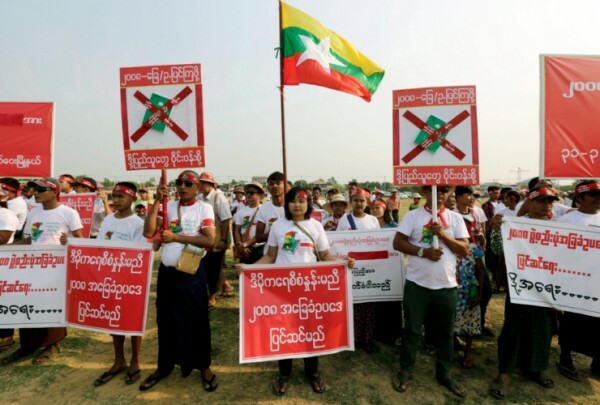 In this case, though, the mayor has channelled popular anger at the cartoons through a state-supported prosecution on behalf of an indeterminate group. The motivation for this move seems understandable, but only because of the context. If we transplant the idea, things look different. In Turkey, insult cases have been frequently brought on behalf of the “Turkish people” to smother unwanted opinions. Earlier this year, two Cumhuriyet journalists were put on trial for republishing a Charlie Hebdo cover featuring an image of the Islamic prophet Mohammad in January 2015. The presumed victims in this case were Muslims offended by the drawing, yet it was the state apparatus that pressed charges in their name. There’s nothing amiss in criticising media outlets for questionable editorial choices, and this Charlie Hebdo series may well be worthy of our disdain and contempt. We can all sympathise with the hurt that Amatrice residents and officials may feel. Nevertheless, the intensity of emotions in this case should not distract from fundamental principles of media freedom. The opinions and views expressed in this article are those of the author and do not necessarily reflect those of the International Press Institute.